Sarah Wilson is our Village Agent, who will be covering Frilsham and once established, Yattendon too. Sarah is supported in the local area by Kaye in Hampstead Norreys and Heather and Sue in Hermitage. 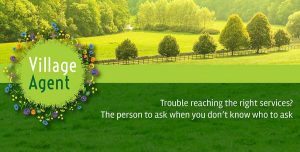 The Volunteer Centre has found that people living in rural areas are very independent but almost overnight may discover they need a little extra help but do not know where to start. The aim of the Village Agent scheme is to help put older and/or socially isolated residents in touch with community, voluntary or statutory agencies on subjects such as housing, pensions & benefits, personal safety, fire safety, transport, social care, leisure, health care and trading standards. The agent can make the phone calls if needed to get things going and will also be able to give out food vouchers for those in food crisis. If there is a solution Sarah will endeavour to find it. Contact Sarah on 01635 622864 or contact Gill Comley, Village Agent Co-ordinator on 01635 581001 or 07775 366812. Or look at the Village Agent website. The Village Agent Scheme is run by a charity - the Volunteer Centre West Berkshire (Charitable Incorporated Organisation no. 1156302).